Peter Rejcek edits Antarctic newspaper The Antarctic Sun, and he was kind enough to answer a number of questions about it over email. Except for one. Okay. Peter, how did you end up with this job? It’s a long story, but the short version is that back in 2003 I got an opportunity to work at the South Pole Station, where a new facility was being constructed. My normal profession is journalism, but I took a bit of a detour and worked for a year at the South Pole in a position known as a carpenter helper, which is an entry-level construction job. I built a lot of walls and even helped put together the new hydroponic greenhouse. After getting my foot into the U.S. Antarctic Program, which is managed by the National Science Foundation, I was able to get a position with The Antarctic Sun, which used to employ three journalists during the austral summer (October to February) when the publication was an 8 X 11 newsletter format. PDFs were also put online. You can still see those old issues at AntarcticSun.usap.gov/pastIssues. I worked two summer seasons, 2005–06 and 2006–07, before going full time in September 2007. Now all the content is web-based, and I deploy (we still use lots of old military terms from when the U.S. Navy handled most of the logistics to support research on the Ice) for shorter periods each summer field season. What’s the office like? Is there one? So, we used to have an office in McMurdo Station’s main facility, known simply as Building 155. That’s where you find the cafeteria, station retail store (souvenirs such as T-shirts and sundry items like toothpaste), offices, dorm rooms and even a couple of ATM machines. Our office was just big enough for three people, desks, computers, and a high-capacity printer for publishing the old print versions of the newspaper. The penguin colony at Cape Royds, Ross island. And what can you tell me about the comics section? I love it. The cartoonist is Matt Davidson. I actually did a profile on him some years ago (last page). He’s been going to the Ice on and off since 1987. He’s a very quiet, unassuming guy, but he has this wicked sense of humor. Some of the comics are probably a bit opaque if you’re not in the U.S. Antarctic Program, but he does a great job, and usually gets a laugh out of me. He published a book a few years back of his best work. And you mentioned to me that you’d just gotten back to the US — what’s your schedule like, with regard to the paper, and seasons, and life in the US? I got back at the end of January after about seven weeks on the Ice. It was my eighth trip to Antarctica. I have about 2½ years of Ice time, which may sound like a lot, until you hear about some people who have gone back every season for more than 30 years. Anyway, I spend about six to eight weeks on the Ice each year. My main mission is to gather news — do interviews, shoot photos, etc. I’ll write a few articles while I’m on the Ice, but generally I’ll use the material from my trip to write about 20 articles over the coming months. During the Northern Hemisphere summer I’ll follow up on other stories that I’ve identified via email and telephone, and perhaps make a trip or two to a university or science conference with strong affiliations to polar research. Otherwise, I live in Denver, where the main support contractor for the U.S. Antarctic Program is located. 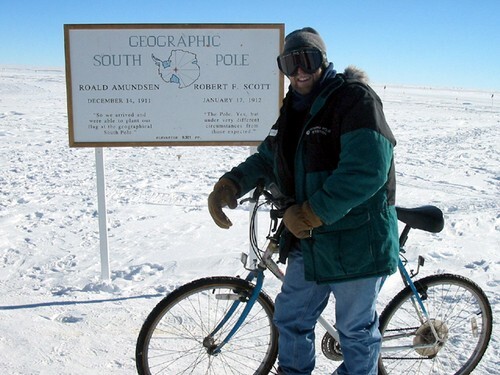 There’s a photograph of you with a bicycle on the South Pole. (!?) Can you tell me about that day? I believe that was taken on New Year’s Day 2004. That’s the actual geographic pole; in essence, I rode around the world in about 10 seconds. : ) That was the year that I spent a winter at the South Pole, where it got down to minus 107 degrees Fahrenheit. January 1 would have been a relatively warm day, maybe around minus 20F to minus 10F. What do you eat in Antarctica? Normal stuff, I imagine, but anything unexpected? Local food? Most of the food is shipped in on a cargo vessel that arrives at the end of each summer season, with provisions for the coming year. During the summer, when we have planes flying, we’ll get some supplies of fresh fruits and vegetables (freshies), which are always welcome. Food is served in a cafeteria-style setting at the research stations. Thanksgiving and Christmas are always big feasts, with meats like turkey, prime rib and duck, along with an amazing variety of sides and desserts. People don’t starve in Antarctica anymore. … Of course, people don’t eat the local food anymore, either. Back in the days of the explorers, they would eat penguin and seal, but that is forbidden now as part of the Antarctic Treaty, which preserves the continent for peaceful, scientific purposes. Do you know everyone there? I wish, but no. 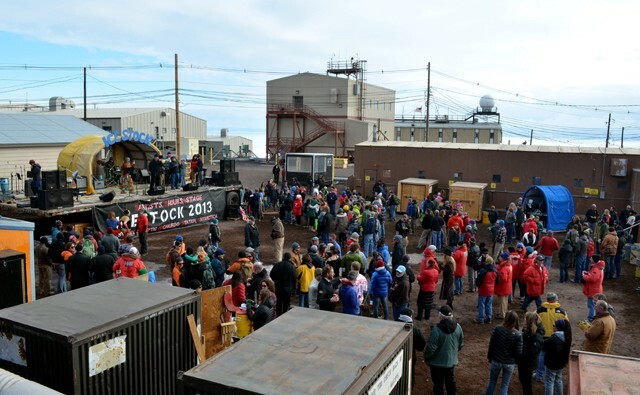 There are about 1,000 people at McMurdo Station alone during the summer at any one time, and that doesn’t include the hundreds that are in field camps during the height of the field season. People come and go all the time during the summer. There’s also about 160 people at the South Pole Station, and another 40 or so at Palmer Station, a small research base that mostly supports marine research. Did you go to IceStock? I did. We had eleven bands play on New Year’s Eve. The music ranged from original acoustic sets to ’80s big-hair band metal. A couple of cool clips on YouTube include one of the finale, which has some nice shots of the area around McMurdo [Ed. — Below, and oh my god this video!] and even a flash mob. Ahh, I have so many questions! How old are you? I turned 40 not too long ago, which means I pretty much spent my 30s connected to Antarctica in some way. That’s seems a bit crazy when I think about it that way. Wait I just Googled some more, and saw you on The Awl, which is The Hairpin’s brother site, which is a little weird but also reassuring. And that was a great piece. Can you tell me about the wine bar? Who works there? Could *I* theoretically work there, or is there a particular method of hiring people in Antarctica? The Coffee House morphed this year into being just a coffee house, where we have open mic nights and endless cribbage tournaments. The baristas are volunteers who have day (or night) jobs. Hiring has already begun for the 2013–14 season. Jobs with the main support contractor range from cooks and dishwashers to snow tractor drivers to field camp staff who may live out of tents for weeks or months at a time. This link will take you to the main jobs page for www.usap.gov. Are there a lot of single people there? Certainly. There are married couples as well. Retirees in their 70s. PhDs washing dishes to get an opportunity to go to Antarctica. The ratio of women to men usually ranges from about 25/30 percent to 75/70 percent. What’s a typical Saturday night? At McMurdo Station, where I mainly work, Saturday is Italian night in the galley (yes, more Navy terms). After-dinner options include plenty of outdoor recreation, if you’re so inclined, including x-country and skate skiing. There are several hiking trails. There are sometimes movies or game tournaments at the Coffee House. Live bands often play. We have a couple of watering holes, Gallagher’s and Southern Exposure. 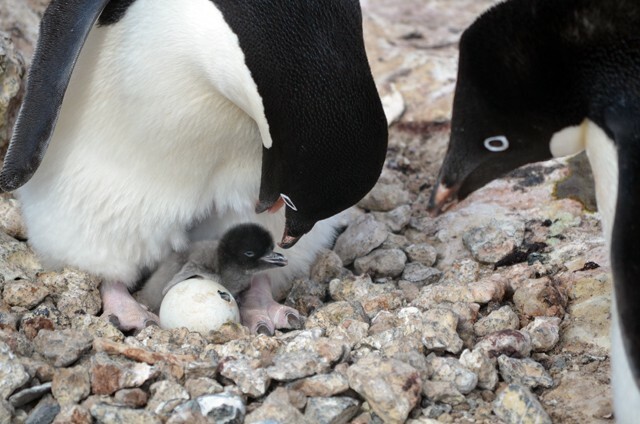 Adélie penguin adults wait for their second egg to hatch. I’ve been reading about the dryness — what moisturizer do you use? Sorry, I can’t do product endorsements. : ) I’m not much of a lotion guy, but you definitely need to hydrate the skin (and body) there; it’s a polar desert and yes, extremely, extremely dry. 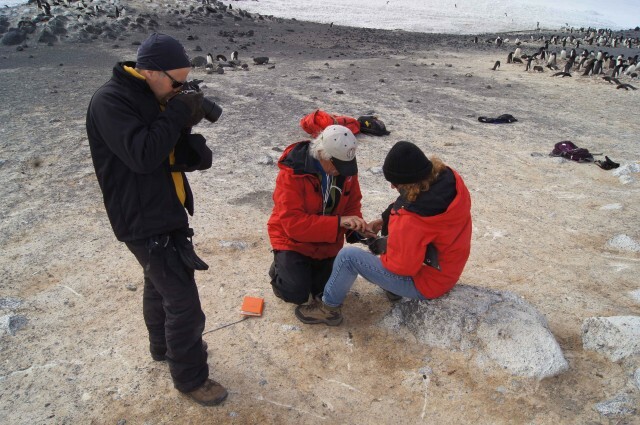 Rejcek shooting a photo of scientist David Ainley and research assistant Jean Pennycook tagging an Adélie penguin at Cape Royds, Ross Island. All research was conducted under and Antarctic Conservation Act 2012–002. So, in a follow-up email: Where do you live there? And what are the cold-safety rules like? And what do you wear, and how do you get there and back?! Living conditions: At McMurdo Station, we live in dorm buildings, with at least one roommate — not unlike college. Bathrooms are shared. Polies (the people who live and work at the South Pole) enjoy the luxury of very tiny single rooms. 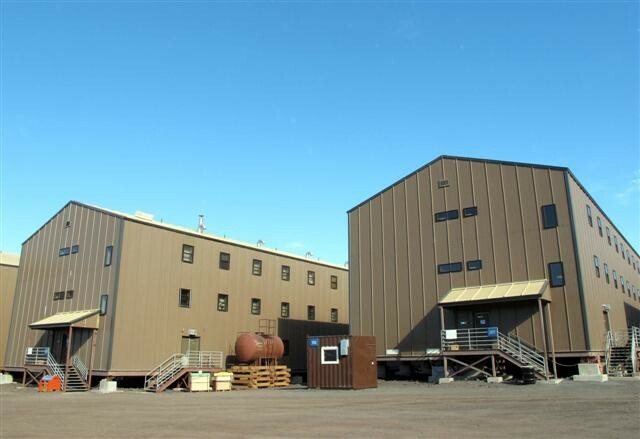 A couple of the dorm buildings at McMurdo Station. Cold-safety rules: Obviously, safety is a big concern down there, because any sort of accident outside of a minor injury or illness will require a medical evacuation off the continent. Our stations are staffed with doctors and other medical staff with very good but basic facilities and capabilities. Most people who will need to venture away from the stations for any sort of fieldwork must go through what we call Happy Camper, a two-day survival course that covers everything from avoiding cold-weather injuries to building snow caves. Most trips require you to take Big Red — a giant red parka that is quite warm and cozy. Everyone undergoes a medical evaluation prior to heading south. Those who winter-over also undergo a psychological evaluation. 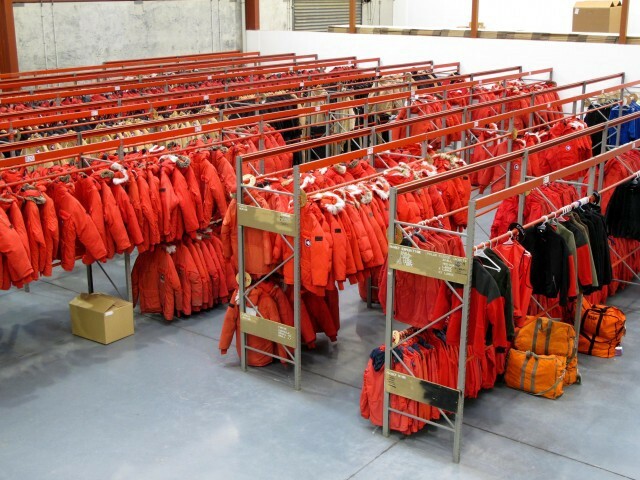 Big Red hanging in the warehouse at Christchurch, New Zealand, where U.S. Antarctic program personnel receive their extreme cold weather gear. Clothing: As I mentioned, we are issued Big Red, a very thick parka. Other extreme cold weather (ECW) gear includes wind pants, Carrhart overalls, (clown-sized) Bunny boots, the thickest gray socks you’ve ever seen, and plenty of fleecy stuff. For day-to-day living at McMurdo in the summer, when the temperature can be around 40F at times, I just wear hiking boots or even sneakers, jeans, a couple of shirts, my windproof fleece, and a puffy (and increasingly patched up) jacket. 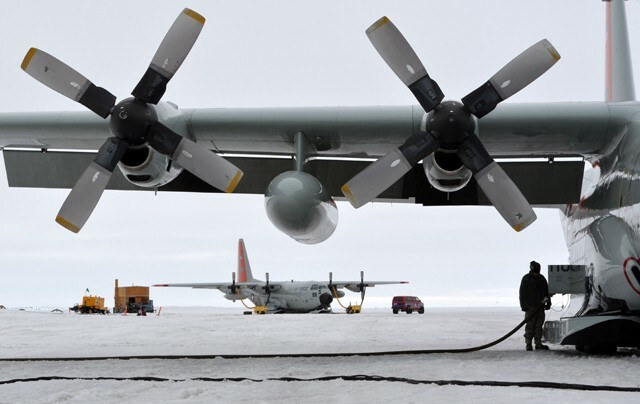 An LC-130 aircraft, operated by the New York Air National Guard, is refueled at the McMurdo Station airfield, which is located on an ice shelf. Travel: It depends on where you’re going. Most of us fly through Christchurch, New Zealand, aboard military aircraft (U.S. Air Force and the New York Air National Guard), which use both wheels and skis for takeoff and landing. It’s about a five- to eight-hour trip depending on the type of plane. 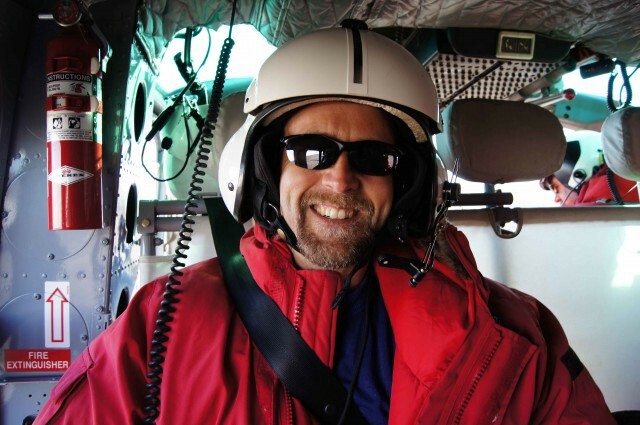 It’s another three-hour ride to the South Pole from McMurdo. Those going to Palmer Station take the slow boat across the Drake Passage from Punta Arenas, Chile. It’s a four-day trip, often across very rough seas. [Thank you!] Is there anything else you’d like to add? Of course, the whole reason I’m down there, along with all the other types of people that I’ve mentioned, is that we’re supporting the scientists who are funded by the National Science Foundation, a $7 billion federal agency that provides grants for a range of disciplines. Most types of science are represented in the U.S. Antarctic Program. Glaciology is obviously a major one, as scientists are very interested in understanding Antarctica’s ice sheets and their potential to raise sea level in the coming centuries. But there’s also biology — think of those iconic penguins and seals. Quite a bit of that research involves understanding the adaptations that these animals possess, which could help medical science down the road. There’s quite a bit that happens under the geology-type sciences, despite the fact that less than 1 percent of the continent isn’t covered by ice. In fact, there are a few paleontology projects, which have uncovered fossilized forests and even meat-eating dinosaurs. Astrophysics is mainly done at the South Pole Station, where the clear and stable atmosphere makes it an ideal place for types of telescopes that help scientists understand the early universe. And, of course, there are oceanographers who study the vast Southern Ocean that surrounds and isolates Antarctica, often aboard our two research vessels, the Laurence M. Gould and Nathaniel B. Palmer. Thanks for the opportunity. Maybe we’ll see you on the Ice some time. 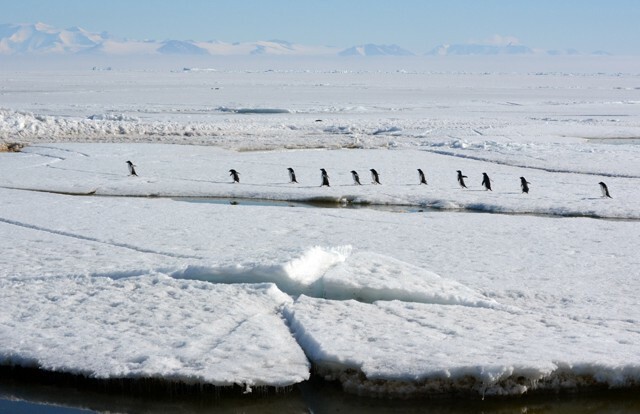 Adélie penguins traversing ice floes on McMurdo Sound. Peter Rejcek is also on Twitter. All photos by Peter Rejcek/National Science Foundation, except the ones in the helicopter and at the penguin colony, which were taken by Elaine Hood; the one at South Pole, which was taken by Andrea Dixon; and the one at the rugby game, which was taken by Rachel Murray. How Much Money Would It Take?